Cigarettes smoking has been popular for a long time. It has been presented as an inevitable part in some people's life. People are addicted to cigarettes for different reasons, such as, relieve their stresses, try to be cool and just enjoy the feeling etc. However, cigarettes smoking is a quite widespread harmful habit and brings deadly harms to health. Carefully read 25 quotes about cigarettes to help you realize its true features and avoid the harmfulness of tobacco industry. Bad habits destroy the person from inside. Cancer is the highest price for smoking habit. Cigarette smokers destroy their dignity. Cigarettes are burning your life. 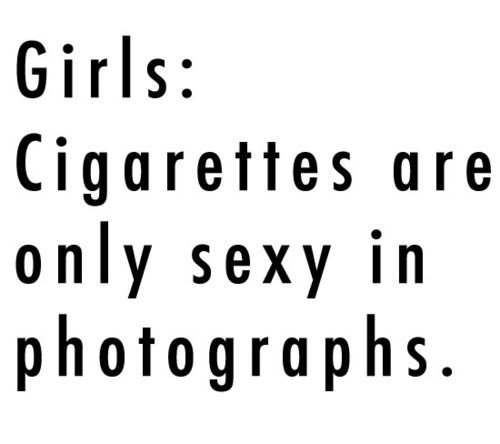 That's true, no one likes the girls who are addicted to smoking. Smoking habit is a widespread addiction. Anyway, smoking is a dangerous habit. Don't try to find the doctors! Smoking is a slow-paced killer. Try to cause interest without any bad habits. Will you choose this way to kill yourself? Cigarettes are trying to kill you. By smoking, you make your life disappear. Stopping smoking brings you a lot of benefits. The image of a "perfect evening". There are a lot of quit smoking methods. Ironic word about cigarettes smoking. The most stupid habit in the world must be smoking. Stop smoking before it ruins you. Try to forget about your cigarettes after reading these warning quotes about cigarettes.